World Ranking-Nordic Walking (WR-NW) only recognizes Nordic Walking Federations (INWA, WONWF, ENWO) and Athletics Federations (IAAF). World Ranking-Nordic Walking (WR-NW) accepts Nordic Walking World Records broken with Judges of Nordic Walking Federations (INWA, WONWF, ENWO) or Judges of Athletics Federations (IAAF). World Ranking-Nordic Walking (WR-NW) accepts Ultra-Endurance Nordic Walking World Records. The walkers only must respect the circuit, the distance and the Nordic Walking technique. Nordic Walking started in Finland in the early 20th century as a summer training for Cross-country skiers. Those skiers trained on Dirt road or Asphalt road. Nordic Walking surface are Dirt road and Asphalt road. 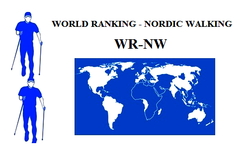 World Ranking-Nordic Walking (WR-NW) accepts the World Records broken on Route (Dirt road and Asphalt road). World Ranking-Nordic Walking (WR-NW) accepts the World Records broken on Snow. World Ranking-Nordic Walking (WR-NW) accepts the World Records broken on Track (Cinder track or Synthetic track). World Ranking-Nordic Walking (WR-NW) accepts the World Records that respect item 2.1. These World Records are included in Route World Records. The official distance of Route, Snow, Cross-Country and Mountain Circuit must be measured by measuring wheel or similar. Official distances (Criterion: INWA/WONWF/ENWO/Portland Marathon): 5 km, 10 km, Half Marathon, Marathon, 10 miles, 20 miles. The official distance of Route, Snow, Cross-Country and Mountain Circuit can be measured by GPS, measuring wheel or similar. Official distances (Criterion: IAU-IAAF): 50 km, 100 km, 50 miles, 100 miles, 6 hours, 12 hours, 24 hours, 48 hours. -The walker must walk with two Nordic Walking poles, doing an alternating movement of feet and arms. First step: right foot and left arm/pole. Second step: left foot and right arm/pole, etc. -The walker must walk with one foot and one pole in permanent contact with route or track. -The walker must not lower his/her center of gravity. Marko Kantaneva (Finland) founded ONW (Original Nordic Walking) technique in 1997. ONW technique is the nordic walking technique of the World Original Nordic Walking Federation-WONWF. International Nordic Walking Federation-INWA founded INWA technique in 2000. INWA technique is the nordic walking technique of the International Nordic Walking Federation-INWA. At the waist level (arms in 90º-100º approximately). Between the center of gravity of the body approximately and just behind the first foot. From the plant of the pole to behind the torso. Then, the hand releases a little the grip of the pole. Walking with propulsion in Nordic Walking poles. World Ranking-Nordic Walking (WR-NW) recognizes ONW and INWA techniques. Dan Barrett (USA) founded FITTREK technique in 2000. FITTREK technique has some appropiate techniques for Competitive Nordic Walking: Full Power, Standard Power, Fast Power and Speed. FITTREK technique has been the nordic walking technique of some North American competitions (USATF-IAAF). These techniques are similar to ONW and INWA techniques (see Rules 4 ). Below the waist (arms in 90º approximately). From the plant of the pole to the torso. The hand does not release the pole. Fast Power technique reduces the arms movement, so it has less propulsion with the poles. Below the waist (arms in 80º approximately). The arms spread completely from the elbows and these move back. FITTREK technique reduces the arms movement and the propulsion. So, it increases speed. World Ranking-Nordic Walking (WR-NW) recognizes FITTREK technique. Tom Rutlin (USA) founded EXERSTRIDER technique in 1988. EXERSTRIDER technique has been the nordic walking technique of some North American competitions (USATF-IAAF). At the waist level (arms in 100º approximately). EXERSTRIDER technique reduces the arms movement, so it has less propulsion with the poles. EXERSTRIDER technique reduces the arms movement and the propulsion. So, it increases speed. World Ranking-Nordic Walking (WR-NW) recognizes EXERSTRIDER technique. Nordic Jogging (jogging with poles) is an illegal technique. The walker must walk with one foot in permanent contact with route or track. World Ranking-Nordic Walking (WR-NW) does not recognize Nordic Jogging technique. The official time must include place, date, distance, names and surnames of Nordic Walkers and their timing. World Ranking-Nordic Walking (WR-NW) only accepts teams with two members. 1.1. World Ranking-Nordic Walking (WR-NW) accepts Nordic Walking World Championships or competitions of Nordic Walking Federations (INWA, WONWF, ENWO). 1.2. World Ranking-Nordic Walking (WR-NW) accepts Nordic Walking World Championships or competitions of Athletics Federations (IAAF). World Ranking-Nordic Walking (WR-NW) accepts Nordic Walking World Championships or competitions with Judges of Nordic Walking Federations (INWA, WONWF, ENWO) or Judges of Athletics Federations (IAAF). World Ranking-Nordic Walking (WR-NW) accepts the World Records that respect item 3.1. These World Records are included in Route World Records. -ONW AND INWA TECHNIQUES (see Rules 4﻿﻿). -FITTREK TECHNIQUE (see Rules 5). -EXERSTRIDER TECHNIQUE (see Rules 6).